Do You Know How to Get the Clicks Without Making the Mistakes of “Clickbait”? “Clickbait” is content that is meant solely to attract clicks and attention, and it usually attempts to accomplish that aim with a single tool: irresistible, clickable headlines. It’s hard not to click on headlines that promise so much, and countless internet users do so every day. After all, they’re called “clickbait” because they are really, really effective at driving more people to click through. If attracting more attention to your website is your goal, then there is a lot to learn from clickbait—even if you don’t necessarily want to model all its habits. ​Cliffhangers. This is a headline tactic that is used a lot on social media sites. The idea is to pull out some tantalizing details for the headline and promise the rest of the story behind the link. You get just enough of a teaser that you almost can’t help but click through for the rest of it. For attorneys, this can be especially effective with case results and client stories. Challenges. Sometimes clickbait works because it challenges people to test their mettle or show off their knowledge. These are headlines that motivate people to find out if they measure up—and to seek those “insider” answers if they don’t. Tricks and secrets. Everyone wants to know how the pros do it, and everyone likes finding little tricks that improve their lives. These kinds of headlines promise innovative, unusual, or “secret” knowledge that you can’t find just anywhere. Fear. Some clickbait headlines play on their audiences’ insecurities and drive clicks by offering the information that might save the day. These kinds of headlines tend to work best when they are very targeted on a specific audience or niche. Overall, the idea with clickbait is to come up with a creative “spin” on content that might otherwise get overlooked. By picking out the most interesting details, thinking about your audience, and finding the sense of drama in what you have to say, you attract more interesting and make those clicks more tempting for your audience. Compelling headlines are a great idea, and clickbait does a great job of creating compelling headlines. The problem is that clickbait usually doesn’t follow through on what the title or headline promises. 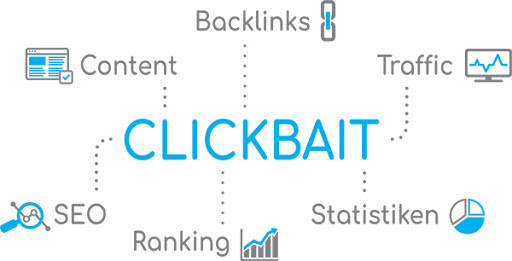 Too often, clickbait headlines are misleading, and they overstate the value of the content behind the link—it’s why “clickbait” is often a synonym for online content that is thin and disappointing. Facebook made the decision years ago to penalize clickbait articles for using dramatized titles that misrepresent their content. Google’s ranking algorithm also takes into account not just the number of clicks onto a page, but how long people stay on that page and what they do when they get there. The lesson here is that, while it’s great to get more traffic, the traffic isn’t really helping your law firm if people don’t find what they need after they click. Instead, you have to follow through by offering the valuable and unique content your headlines promise. Find out more about what online audiences want from digital marketing. Do you need help creating content that attracts, converts, and retains more of your perfect clients? Talk with us about our content writing services, or request an FWM marketing analysis to find out more about the current performance of your marketing efforts. Looking to Grow Your Firm? Done For You Practice Expansion Packages!